Highly desirable condo in Southmoor Park w/easy access to Downtown & DTC! Features a separate living/dining area w/wet bar. Family Rm w/charming natural brick wood burning fireplace w/chimney spark arrester. 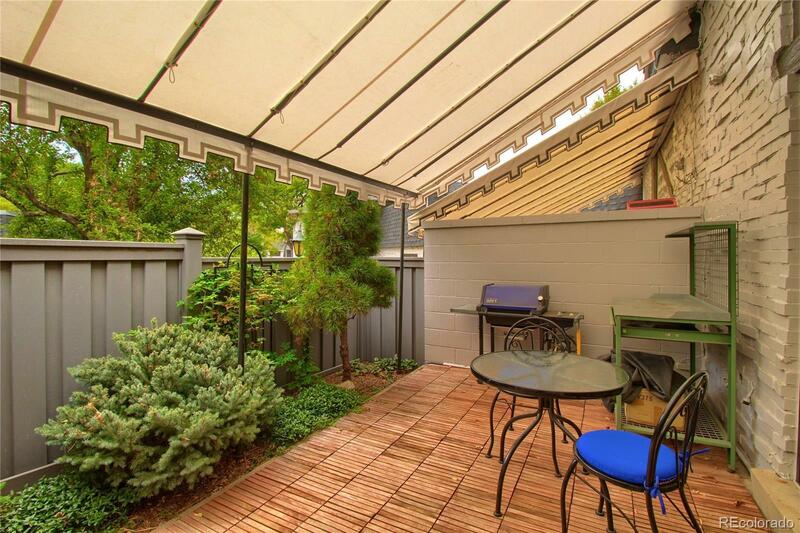 Private patio w/Trex fencing & awning. Restoration Hardware potter's bench, table/chairs set incl. in the purchase! Master bedroom w/west facing Pella window/patio door slider w/transferable warranty. Custom his/hers master bedroom closet. Lrg rooms & incredible closet storage throughout. Walled off 1 car garage-feature is only present in less than 1/4 of complex garage units w/Hyloft garage storage system. Professionally electrical grounded for direct broadcast satellite svc & cable ready. Kitchen appliances incl. w/washer & dryer hook-ups. Crown molding lvg-dining-bdrms. Heat incl w/the monthly HOA fee. Well maintained community. Exteriors recently painted- & renovated clubhouse. 2018-new roof-Patio Awning-Garage Window-New tile in kitchen/front entry.